Antoine Branck is a Breton farmer who takes care of the horses at Bay Roan Stables in Bravil. If you want to buy one, talk to his employer Isabeau Bienne. A Breton with a strong dislike for Regulus Terentius' lack of interest in the welfare of the county, Antoine spends most of his time tending the horses, while scouting the Green Road for potential customers. He is not allowed inside the stables and only owns a bedroll without any form of coverage behind the building. Regardless of the weather he sleeps there every night between 10pm and 6am. After waking up, he spends the first two hours of the day strolling around. At 8am, his workday begins, and he starts raking the ground inside the corral. He stops at noon and sits down on the bench near the stable door for a two-hour lunch. He gets up again at 2pm and spends all afternoon wandering around near the stables. At 6pm, he once again sits down on the bench, this time to enjoy a two-hour dinner. At 8pm, with the stables closed and not much to do, he just loiters lazily around the pen until he returns to his bedroll at 10pm. The one exception to this schedule occurs after Isabeau sells you a horse, then Antoine will stand next to the horse until you mount it, before resuming his usual routine. Taking care of horses seemingly does not provide much wealth for Antoine as his wardrobe is pure lower-class; a shirt with suspenders with a pair of blacksmith's pants and stitched leather shoes. He wields an iron war axe and carries his rake and a small amount of gold. When you approach him, he will do his job and point you towards Isabeau: "If you are looking to buy a horse, go inside and talk to Isabeau." If you choose to buy a horse, Isabeau will send you back to Antoine with: "Go out to the corral. Antione [sic] will have your new Bay saddled and ready for you." Outside, he will present it to you plain and simple: "Here is your horse." If you manage to speak with Antoine before hearing this comment (see bugs) he will say: "This is one of our best Bay horses. Take good care of him." On the subject of Bravil, he will passionately tell you his honest opinion about the Count and his son: "The Count was once a tournament champion. Now he's a loafer and skirt-chaser. 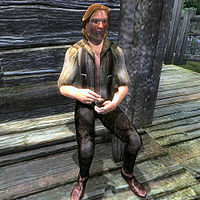 And his son, Gellius, is a spoiled good-for-nothing skooma-sucker." An additional greeting for Antoine was recorded, but will never be heard in-game as his stable dialogue takes precedence: "Antoine Branck. I just work here. If you want a horse, go inside and talk to Isabeau." Due to an odd script, only one of Antoine's two post-purchase dialogue lines can be heard, and only once. This page was last modified on 17 June 2018, at 11:40.